For more information, contact Syndric Steptoe, director of the Alumni Career Lab, at syndric.steptoe@al.arizona.edu or 520-626-4948. ✓ Share alumni job opportunities on the Bear Down Network alumni job board. Start by registering at beardownnetwork.com. ✓ Post internships and jobs for students and alumni on Handshake. ✓ Tweet jobs for UA alumni with the hashtag #HireACat. 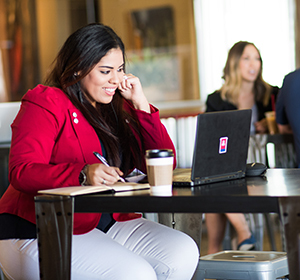 ✓ UA Career Services can help you develop and recruit for an internship program. More information. ✓ UA Student Engagement & Career Development holds career fairs for UA student and alumni around the year in Tucson and Phoenix. Come to a career fair. ✓ We also partner with other schools for alumni-only career fairs around the country. Contact Syndric Steptoe at syndric.steptoe@al.arizona.edu or 520-626-4948 for more information. *Graduates of the Eller College of Management looking to host students in a job shadow program get more information here.